With Gutter Helmet®, you are protecting your largest investment – your home. Your home is most likely the largest investment you will make. Gutter Helmet gutter protection helps you protect that investment by keeping damaging rain water where it belongs—in the downspouts and away from your house and your landscaping. Water running off of your roof can splash back onto your home, causing flooding, foundation damage, soil erosion, rotting wood and siding damage. In addition to preventing that damage, Gutter Helmet is a beautiful complement to your home, with a sleek design and textured PermaLife™ finish available in your choice of color. Our rain gutter system is made of a textured surface, allowing rainwater to cling to the surface as it flows downward. The edge of each of our gutter guard systems is curved and extends past the edge of the gutter to allow rainwater to flow naturally into the gutter system. Once the rainwater rounds the edge of the Gutter Helmet system, it passes through a slit that is only 3/8” wide, used to stop debris, leaves and other materials from getting into your gutters and clogging your system. While water can pass through the opening at a steady rate, debris is stopped by the small slit, allowing only water to pass through your gutters. With the ability to handle 22 inches of rain each hour without overflowing, Gutter Helmet® is the best gutter system for any home or commercial building. The highest recorded rain amount in the United States is only eleven inches each hour, proving that Gutter Helmet® has the ability to handle much more than Mother Nature can throw your way. 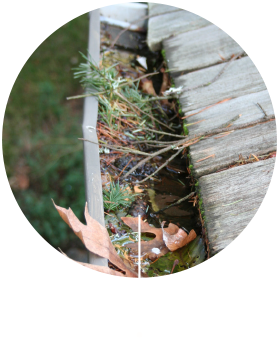 If you’ve ever had to muck out a clogged gutter, you already know one of the biggest real-world benefits of having a gutter protection system installed: not having to do the job yourself. The problem is, this semi-annual chore not only requires plenty of time and energy, but also the risk of life and limb. Nearly half of all fatal falls that occurred within the last decade have involved a ladder. 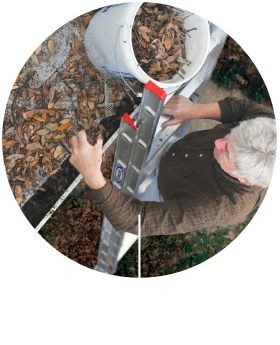 Gutter Helmet® eliminates that risk by guaranteeing that you’ll never have to clean your gutters again. Clogged gutters can cause gutter damage, siding damage. Leaks can lead to foundation cracking. 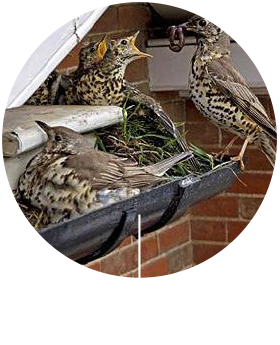 Clogged or poor draining gutters are a good place for birds to set their nests or insects to breed. 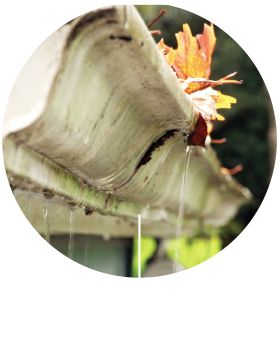 Lack of drainage may cause your gutters to fill out with debris and cause roof leaks. These may need to extensive interior damage. Cleaning gutters is a hazardous task. Nearly half of all fatal falls that occurred within the last decade have involved a ladder.